Two of my oldest friends and some of my most favorite people in the world are Jamie and Micaela. They are sisters and our families were close growing up and did a lot together. I got a huge treat today because Micaela had e-mailed me and said her family was going to be in my area today and wanted to know if we could meet for lunch. I have been so excited all week to see them. I've known Micaela since she was 3 years old and she is one of the funniest, kindest, most beautiful people I have ever met. She has never met a stranger. She has a gift of making people feel at ease and well liked. 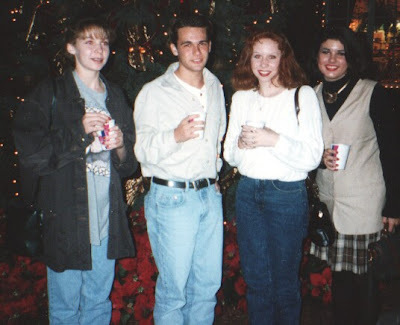 This is an old picture of my brother and I with Jamie and Micaela at Silver Dollar City one Christmas (I'm guessing around 1994). Micaela was a college basketball player. She was so athletic. 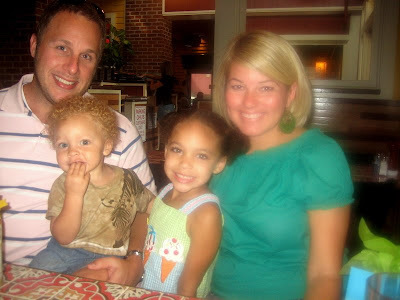 This is her sweet husband Mario and her daughter Jaiden. 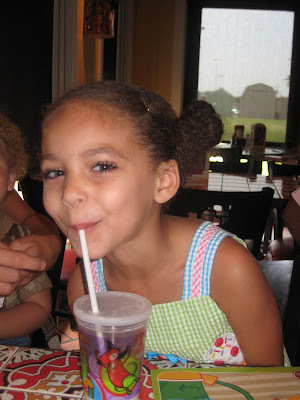 I promise Jaiden is going to a model or Miss America one day. 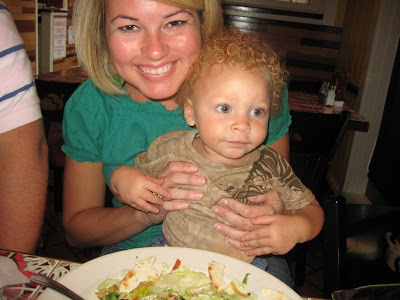 This is their little boy Jeryn. Don't you just want to squeeze his cheeks? He is the cutest thing in the world. He let me hold him and then he wanted Scott to hold him which just made my heart swell! I was a little blurry in this picture but it was good of Scott and the kids. We had so much fun visiting with them today! Micaela gave me this sweet little photo album and this soft book with tags that I know our baby will love! I can't help but post all the gifts people have given us because every one of them have meant SO much to me. I want to remember and cherish everything our baby is given. I was so surprised when we got home because I had a package in the mail. One of my friends at church has a sister who went through in vitro and now has two beautiful twins. I prayed for her a few years ago and she has been praying for me. She sent me the most awesome package ever. She gave me "Baby Wise" which I'm THRILLED about because I was close to buying it. It has come very highly recommended to me. And a little photo album to put our baby's relatives and friends pictures in it to show them. And I know you can't really read this but she made me the neatest Pregnancy Survival Kit. It came with Preggie pops, Travel Toothbrush, Charmin toilet seat covers (for endless trips to public restrooms), Bra Back Extender (cause things are growing), Emery boards (for fast growing nails), Kleenex ( for the constant crying), Tums (for the heartburn), Lotions and Chocolate. Isn't that the sweetest thing? I am planning to remember that and use it for any friends I have in the future who get pregnant! All of those items will come in handy I'm sure. I was actually just pretty overwhelmed that someone who has never met me would take the time to put together something so neat for me. It made me cry showing it all to Scott. God has blessed me with so many people in my life who I have met or have not met that He has used to encourage me. It has challenged me to work harder at doing more for others. WOW! Those kids are gorgeous!! What sweet gifts! I love the pregnancy survival kit...how clever is that?! What neat gifts!! Waiting to see what your nursery will look like!! Have a great Sunday as well! Baby Wise is great!! We've used it with all our kids and highly recommend it. Those children are sooo cute! Those are really neat gifts! I love the pg survival kit! Make SURE you read or at least get the "gist" of Baby Wise! It is the best and saved our life. Our daughter was on the perfect 6, 10, 2 schedule...she would eat at those times even if we had to wake her. Keeping baby H on a schedule is key to him/her sleeping through the night! :) Good luck with that! That picture from 1994...Both of you had dark hair...wow You both make great blondes. I swear by baby wise. Best book out there. You will love it. Read now, don't wait to see if you need it. Gorgeous children!!! Curled eyelashes...no fair! Love his curly hair, too. I love the preganancy survival kit... what a great idea. 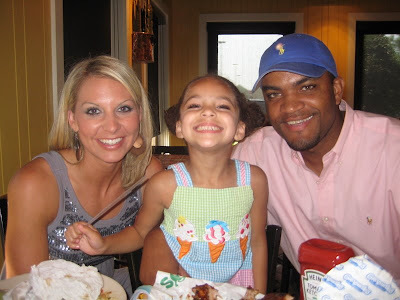 The Thomas family is beautiful - inside & out!! Jaiden is JUST like I remember Micaela. Those children could not be any cuter. I love them! WOW those children are just beautiful! What a precious gift and great idea! I might just have to steal that one. :) Thanks for the info! I am a faithful (every day!) reader and LOVE your blog...Just wanted to say that Babywise is THE WAY TO GO! I can't say it enough! I have boys that are 4,2, and 8mth old and I have used it with each of them. They are all different, but have responded well to the techniques! Aww! Ya'll did have lots of fun with friends! And I love that pregnancy survival kit! Also your other goodies! I know ya'll are still sooo excited! YAY! I'm probably the only one who will tell you that Baby Wise is horrible, horrible. I could not stomach letting my child needlessly cry for hours just to make my life a little easier. Babies cry because they need something. And sometimes that something is their mommy, just to be held or to feel safe and secure. Please read up on the downside of Babywise as well. I don't want to open a can of worms, but it isn't always a good thing. I know some people swear by it, but I'm not one of those people. I'm a fan of Dr Sears. He has "The Baby Book" which I love. I read Babywise and tried it for about 2 weeks, but I could not let Abigail cry and just did NOT feel right about it. So, I chunked the book. She still slept thru the night early and was sleeping 12 hours at 6 months. But, she was never on a strict schedule. Noah ate every 4 hours all on his own, it is just what he did... and he was the fattest of all my kids. Isaac was the most difficult baby of all my kids. He was happy, but it took a lot to make him happy and he ate sporadically. But I am so grateful for him b/c he taught me more about being a mom than any of the others. When I let go of what I thought I needed, life was better. I had a 19 month old and an almost 3 year old when Isaac was born... and I survived without a schedule. I was gung ho scheduling before Abigail was born, but then it just killed me and I do not believe God gave us our instincts to ignore them. I'm NOT saying any of this to belittle anyone who has used it successfully. It was not for me. I just remember feeling GUILTY for not using it b/c it seemed everyone I knew did. What I am saying is please please please do what you feel is right regardless of what the plethora of people will tell you. If it is Babywise, fine. If it is total attachment parenting (that'd be me in the first year, but I don't stay total AP all the way thru childhood), that's fine too. It is a touchy subject for me b/c I LOOOOOOOOOOOOOOOOOOOOOOOOOOOOOOOVE the newborn stage. Love love love love love it. Breastfeeding is extremely important as well IMO... and often Babywise makes it difficult to do so for a full year w/o supplementing. my son loved his "who loves baby" book. Those are beautiful children. The jeans looks great. Glad to know you are feeling good. that pregnancy guide is the coolest thing. How fun, I'll have to remember that, too. Oh, and thanks for the tip on the comments thing, I was pretty sure people thought I was addicted to gambling since I kept getting those lotto, things! ha! I am in the smack center of the Babywise debate - my advise is to read the book AND others as well. Go with your instincts. The critics of Babywise claim mothers let babies cry for hours endlessly, which I have not ever found to be really accurate, and the other side has their own exaggerations as well. A REALLY REALLY great post on this is http://femina.reformedblogs.com/2007/09/09/salt-and-sugar/. Highly recommend reading it. oh and one more thing, the whole baby wise, baby book, thing~Whether it is Harper or Hudson, you will know what to do. The books will give you confidence going into it, but when the time comes to decide on what to do next~ you will know. The baby gifts are so sweet! I love the survival kit, I am going to have to remember that one. Your friend and her kids are beautiful!! It was so nice that you got to see them again. Wow, what awesome gifts! I just gave birth to my first child one year ago and love reminiscing a little by reading your blog! You are adorable pregnant! I also wanted to recommend that you try Gripe Water. It works wonders for when your baby has tummy trouble, hiccups, etc. It was a miracle worker! Oh my gosh! Becky & I graduated High School with Mario - he was one of the NICEST guys EVER! His kids & wife are beautiful! That is so precious! I love reading your blog Kelly & I'm so happy for you & Scott! GIRL! Baby Wise is awesome. Both of my daughters slept through the night (10-12 hours a night!) by 9 weeks. And they still do!! Adhering to a feeding/sleeping schedule makes all the difference. Some criticize BW it for its so-called "cry it out" approach, but we never found our daughters crying "for hours". We're talking a few minutes tops, and once you get that schedule going they'll stop fussing when you put them down altogether in a couple of days. Because they know what to expect and find comfort in their needs being met consistently. I recommend reading it early on in the pregnancy so you can ask questions. I found myself needing some clarification on a few points. Oh Wow! Me and Bon graduated highschool with Mario! They have beautiful babies...that's so neat! What cute children and what precious gifts! I love the Pregnancy Survival Kit. What a great idea. How fun to meet up with childhood friends like that. Special times! Looks like a great time with your friends! Cute gifts! 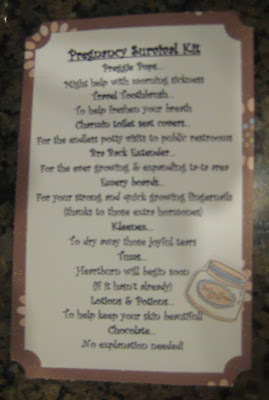 The survial kit is a great idea for baby showers! P.S.- My mom works at ANB with Vonda!!!! Small world! I'd love to get the wording form the Pregnancy Survival Kit that yo received...What a great idea! If you get the time, will you email it to me? My cousin is expecting a baby and I'd love to do this for their shower. We HIGHLY suggest Baby Wise (and Toddler Wise when the time comes) also...it saved us. AND IT WORKS. Our twins slept through the night at 8 weeks, and LOVED nap time until they were 6 years old. We put them to bed AWAKE and they went right to sleep. IT WORKS and it is wonderful to give the gift of good rest to your baby! I read BabyWise and loved it....Pretty much everyone I know has used it and it has worked for them. I know some principles will be hard to apply once he gets here, but ultimately I think it is really good. Love you girl!! Such sweet sweet friends. Even those of us who have never met you, love you, your heart, and your beautiful family! Hi Kelly! 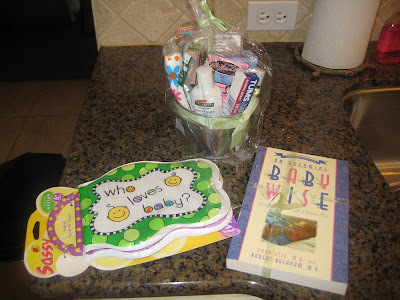 I am pregnant also and would have loved to receive a pregnancy survival kit! How cool is that! Several of my friends are expecting also and I will be definitely using that idea in the future! Have a great weekend! What cute gifts! Lots of opinions here on Babywise, I read it and did some of it, but I would say take it with a grain of salt. I used most of the principles in it and my girls are wonderful! Good sleepers too. But I wouldn't be so stressed over following everything it says to do. Blessings to you! Have a great week! Hey Kelly! I have a surprise for you on my blog...check it out! I love the Pregnancy Survival Kit idea!! How clever! That is awesome that you felt the baby move today! I know it can't be too much longer till I can feel mine moving too! I can't wait to experience that!! Have a great week! Hi soon-to-be Momma, I just came across your blog! Sweet post and agreed beautiful children :) What great gifts. We used a combo of BabyWise and Healthy Sleep Habits for our little guy and it worked great! He sleeps wonderfully and is an angel...99 1/2% of the time! :) And I love the belly pics with the fruit or veggies of the baby's size, I will have to remember that with the next one! You are so lucky to have grown up with Jamie. She is SO sweet! And, I agree that Jaiden is gorgeous! 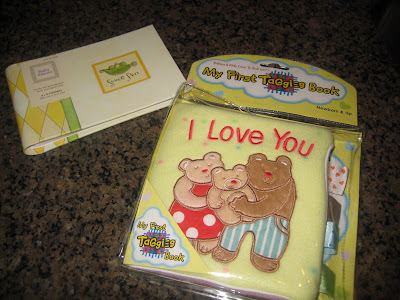 I love that you are keeping a photo diary of the baby gifts you receive. Baby H will love seeing all of this one day. I tried Baby Wise, but it didn't work for me. I just couldn't let my babies cry. However, I have several friends that swear by it. Even though my babies were on their own schedules, we made it fine. So, if BW doesn't work for you and Baby H, don't sweat it. That pregnancy survivial kit is a very neat idea. I might need to make one for my cousin (she's almost months). That little girl is PRECIOUS!! We LOVE Babywise around here. I didn't start it with either one of my babies until they were 6 weeks. And I wasn't completely STRICT with it! I let my babies cry themselves to sleep; but I never let them cry for hours and hours. I think the longest Em K cried (and she was the hardest) was MAYBE 10 minutes. Your maternal instincts will tell you what to do. It works for some people... and some people it doesn't! Drew was a textbook "Babywise" baby. Did everything PERFECTLY! Emma Kate was a bit (ok a lot) more difficult to "train". I also applied some things from Healthy Sleep Habits with her and that was great! You will do great! Her babies so sooo cute. I am going to have to save the survival kit idea. I have once that is more for the baby shower but this one is a great idea. There is nothing better than old friends! I am so glad that you got to spend some time with that BEAUTIFUL family!!!! Aren't you just loving the gifts? I know that this is just God's doing! You are such a sweet person Kelly and you deserve EVERYTHING! It looks like you had a fantastic weekend! I love spending time with my girlfriends. That pregnancy survival kit is too cute. I'm glad you had a great weekend!! Only 11 days to go...aren't you so excited!!! So cute! I am a long-time lurker but had to take this opportunity to be Debbie Downer. The sassy Who Loves Baby book (one of my little girl's favorites) is made with PCV vinyl likely contains lead. There are lots of cute fabric alternatives I think, though! Those kids are so gorgeous! Those eyelashes, that blonde hair and dark skin! What a cute gift the preggy survival kit is. Great idea to copy! love the pregnancy survival kit! I am having a swap at my blog, not sure if you are interested, but I know there are a lot of preggos around thought I could pair some of you guys up if you are interested let me know! That is such a swet post!!!! I love the Pregnancy Survival Kit!!! What a great idea!!!! Cute pics with Mic and family. Love the survival kit. I'll have to remember that one!! You are absolutely adorable and I am so happy you are pregnant! Please, please do some research before you do Baby Wise. I have 3 kids who are wonderful, respectful, sleep through the night, on a schedule kids. I looked into Baby Wise with my oldest. SO, so, so glad, through much prayer I decided to chunk it. I am so glad. Baby Wise...no!!! There are serious concerns with the authors of these books. Babies cry for a reason. The first year of life is for the baby to learn to trust that his needs will be met. Bonding occurs when the baby and mom are in sync, not when the baby learns not to cry b/c his needs will not be met. Answering a baby's cries DO NOT lead to a selfish child, quite the opposite. There are other methods to help a baby sleep through the night. Most will do it on their own, but there are ways that don't intefere with bonding. I found that Baby Wise and Dr. Sears are on opposite ends of the spectrum. We landed somewhere in b/t, but always erred on the side of meeting needs. I wish you all of God's best in raising your blessing!